For the past nineteen years there has been a Special Bike Show in Germersheim near Mannheim in Germany, called SPEZI Radmesse. This year was my chance to attend! Last July I met a bunch of velomobile riders from Germany, one of whom lives near me in Schwalmtal. Back them he said that I could go to SPEZI with him so all the details were finalised over the last few weeks. I would drive to Rolf’s house in Schwalmtal for 7am and then we would travel together in his car to Germersheim. The original plan was to collect Gabriele (Jedrik) and a friend on the way past Bonn but in the end Gabriele decided to cycle to Germersheim in her Quest Velomobile the day before, which she duly did (all 280km). The night before I left for SPEZI Lara, the daughter of the house, asked what time I was leaving as she had to be at Kempen railway station by 6:15am for a train to Köln for a University event. As I had planned to leave at 6:15am I was happy to get up fifteen minutes earlier to save her cycling to the station and having to lock her bike up all day. The battery in my car had seemed a bit weak recently but I was reluctant to start it the day before to check as I’d need to run it for a fair while to recharge it and I didn’t have anywhere to go on the car – I hadn’t used it for a fortnight and apart from this trip to Schwalmtal had no plans to use it for at least a month. So I warned Lara that it was a bit dodgy. And I was right – the car didn’t start. It almost did, then gave up. Fortunately Lara’s father was awake and I had jump leads ready so we tried to jump start it using their Opel Agila; no dice. So Frank moved the Agila away and brought over their VW Transporter – again, it was almost catching but not quite. Time was ticking away for Lara’s train (she had a specific ticket for the 6:15 train) so I assumed Frank would drive her to the station himself in their car and I’d see what I could do about starting mine later (or get a taxi to Rolf’s or something). Instead Frank handed me the keys to the Agila and said to take that, and that his insurance would cover me. So I grabbed my stuff, locked up my car and hopped into the Agila with Lara. For the last twenty years I have driven an automatic car as my bad arm doesn’t get on well with manual gearboxes. Of course in a German car the gear stick is on my ‘good’ side but it was still an interesting start to the morning, driving an entirely unfamiliar car, left hand drive, which was a manual. I wasn’t very good at finding the clutch biting point for the first mile or so but eventually got the hang of it. Lara made it to Kempen station with five minutes to spare. I dropped her off and then headed on to Schwalmtal. There doesn’t seem to be that much traffic in this part of the world during the day but at 6:15am on a Saturday morning it was beautifully quiet – I was pretty much on my own for the whole forty minute journey. I arrived at Rolf’s, parked the car and then we hopped into his Vectra and headed off to the A61 motorway which would take us pretty much the whole way to Germersheim. (333km). Rolf said that a few years ago he got stuck in a traffic jam and it took him six hours – this year the roads were great and we were there after just three hours. We parked right opposite the exhibition halls (with free parking – you’d never get free parking at an exhibition in the UK!) and walked past the Parcours to get to the Halls. There were bikes and trikes and other weird vehicles whizzing about everywhere the whole time! The entrance fee was 9.50€ which I thought was pretty decent and was given a blue wristband to allow me access to the various halls and outside areas. There were also various brochures and maps handed to me. I went straight into Hall 1 which had a group of exhibitors including ICLETTA who are the German distributors of ICE Trikes (and other bikes/trikes). ICLETTA’s stand was being shared with three chaps from ICE. Displayed proudly on the stand was Maria Leijerstam‘s White ICE Cycle which she used to ride to the South Pole in December. And here is Elliot from ICE who seemed to know exactly who I was when I introduced myself. Most of the visitors to SPEZI seemed to be Germans and speaking German so perhaps he was pleased to speak English with someone. Anyway he was extremely helpful, talking to me for over an hour about a lot about the changes and updates that ICE have been doing recently to the range. Here he is standing beside Kurt Seifert (of ICLETTA)’s ICE Sprint with Rohloff and various other changes from the standard ICE Sprint. During our conversation we spotted a guy in a red cycling jersey with reflective writing on the front saying ‘Keep calm and ride an ICE Trike’. The chap had a Lonsdale London backpack and jogging bottoms so I assumed he was a Brit but no, he was German. We had a good chat (I translated the salient bits for Elliot) and discovered that this chap prints his own cycling jerseys. He gave me his card – he is Tomas Bernd Wiedemann and his website is www.mobil-mit-muskelkraft.de. And here is his page about jerseys and other cycling gear that he produces: Liegerad T-Shirts, Pullover, Trikots uvm. His comment to Elliot was that ICE didn’t do enough merchandising really! After having a very enjoyable chat with Elliot I wandered on and had a really good look around. I was amazed at the number of different recumbent bike and trike dealers, as well as lots of upright bikes, Bromptons and other folders, electric bikes, vehicles for people with disabilities and more. Readers of my blog know that I have recently bought a Flevobike Versatile. The Versatile is now marketed as the Flévelo Orca. Flévelo had two Orcas at the show and it was really interesting to see them – the differences in the nine years since Penelope was built aren’t significant but incremental. I subsequently saw one whizzing past and it seems to cant over on cornering which probably explains all that faffage at the crosspiece. I did feel it was rather unfortunate that they used Comic Sans font for the logo though! There were hundreds of people at the exhibition and it was a beautiful day – 25 degrees and sunny. The second day of the exhibition, the Sunday (today), it’s rather rainier in Germany so I hope those exhibiting outside are still having a good time. And hundreds of people whizzing around on recumbents and other weird bikes and I didn’t see a single crash. Rolf, who I travelled with and has visited SPEZI many times, said he had never seen an accident. Amazing! People were riding round the exhibition halls too. I was also pleased to see loads of disabled people visiting – hopefully they were getting options for bikes that might suit their individual needs. Elliptigo were exhibiting – I last saw one of these on the last stretch of LEL. Amazing machines! The very popular Velomobiel.nl stand! Three wheels good… four wheels better? The display bikes were all pretty shiny although there were a lot that you could try out there and then. I had to periodically dodge people cycling within the Halls. Five HASE trikes linked together like a train. The SPEZI shuttle. I used this – knackering on the legs for just 200 metres! A very shiny Ordinary. The chap says it was from the Czech Republic and very new. I had a very enjoyable day. We had a two hour look around and then met for lunch with some others which was long and leisurely at a Vietnamese place, then went back to look at more bikes. I managed to only spend about 20€ on things at Spezi – a t-shirt from the German HPV association (my friend was manning their stand) and a set of cleats for a tenner. Rolf and I left at 5:30 after meeting up with some of his friends from the German Velomobilforum. You can tell velomobile riders – they all have very tanned faces but very pale arms and legs. I am purposely using Alfie the trike every few days to attempt to get a bit more of a tan! Anyway, good fun was had, and I was home by 9:30pm without crashing the landlord’s car. Bonus! 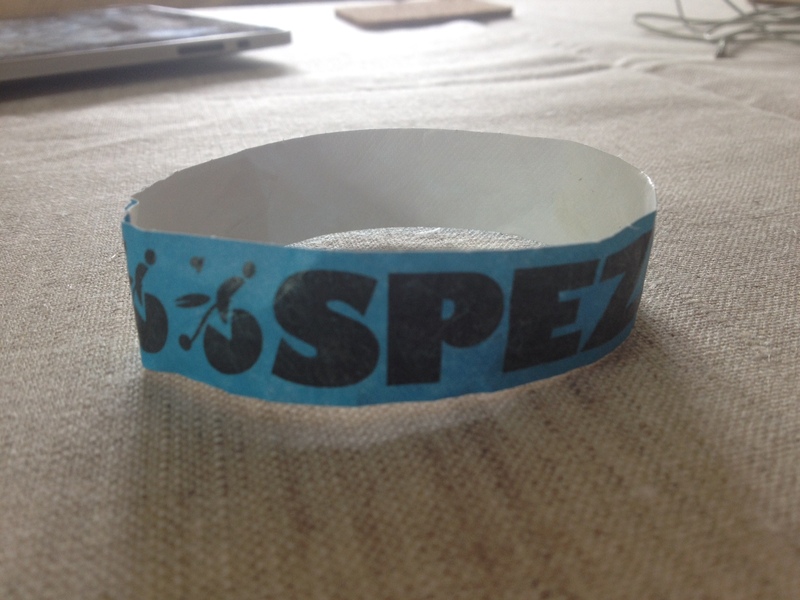 I certainly recommend SPEZI as an event to visit – there was loads going on and plenty of food on offer which didn’t have ridiculous price hikes like you might see in the UK at exhibitions. There was some kind of racing event going on that I didn’t watch and a whole hall of E-bikes which I only had a cursory look around. All in all well worth the entrance fee and a great way to experience some of the weirder bike options that are out there!